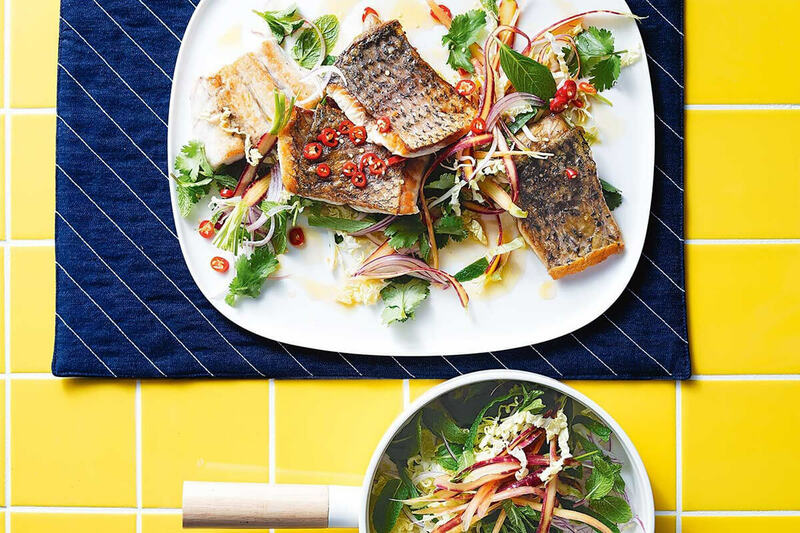 A crispy fish dish you can put together in minutes with an oh-so-tasty, healthy Vietnamese dressing. Heat oil in a frypan over medium-high heat. Add the fish, skin side down, and cook, pressing down for 2 minutes to flatten, then for a further 4 minutes or until skin is crisp and golden. Turn and cook for 3 minutes or until cooked through. Set aside to rest, lightly covered in foil. For the dressing, combine all the ingredients and set aside. Use a mandoline or vegetable peeler to slice the carrots lengthways into ribbons. Combine with remaining ingredients and toss with some of the dressing. Serve with fish and drizzle over remaining dressing.